Tagged under Kyoto Animation, Drama CD, Light Novel, Series. Free! is the story of four elementary schoolers - Haruka, Makoto, Nagisa and Rin - who compete in their town's swimming tournament. After winning, the four part ways but reunite in the same high school after a few years. With an unofficial competition between Rin and Nagisa, the Iwatobi High School Swimming Club is born! Haruka, Makoto, Nagisa and Rei must now work together to raise the club to greatness and defeat Rin officially! The prequel movie, based on the same-titled light novel, High Speed!, focuses on the boys and their other friends as middle schoolers. Haruka and his childhood friend, Makoto, enter Iwatobi Middle School and decide to join the swim club there. But unwillingly, they come to unite with Asahi and Ikuya in the same relay team. These four boys are quite different in their thoughts about swimming, and each of them is burdened by his own worries. What is necessary for them to become a "team"? What is Haruka thinking in this new situation? Now, devoting their time and youthful energy to swimming, their adolescence begins. This was a really entertaining series to watch and very engaging in telling the coming-of-age story these characters and the close-knit ties they have to one another. Rin Matsuoka came to be my favorite character of the entire series and he really developed as a character in the second season. The relationships of the characters are endearing in their camaraderie to one another and how each will do whatever it takes to support the one they're closest to. The anime series has a great cast of seiyuu and I loved Mamoru Miyano's performance as Rin and Yoshimasa Hosoya as Sousuke, but I feel Makoto and Nagisa's voices as children could've been performed by seiyuu who have a better grasp of voicing young boys like Houko Kuwashima and Mamiko Noto. It's about swimming; which is a bit different. The OP sounds pretty good. Kinda funny how all the guys have names that sound like they'd would be girls instead xD Overall I thought it was a good show. It was nice to see Rin finally own up/come to terms with his feelings about his friends, be honest with himself and stop being a jerk. Очень приятное аниме с юмором . Нравится как продуманы персонажи , у каждого парня есть свой неповторимый характер , что очень радует . О сюжете , сюжет самый что есть обыкновенный но раскрытие его на все сто процентов, не в каждом нето-что аниме фильме увидишь полностью законченную сюжетную линию . Особенность Фри ещё в том что это первое аниме про плаванье и без тупых тянок . Минус яойные подтексты ,пусть нечастый и довольно невинный, но все же он есть . 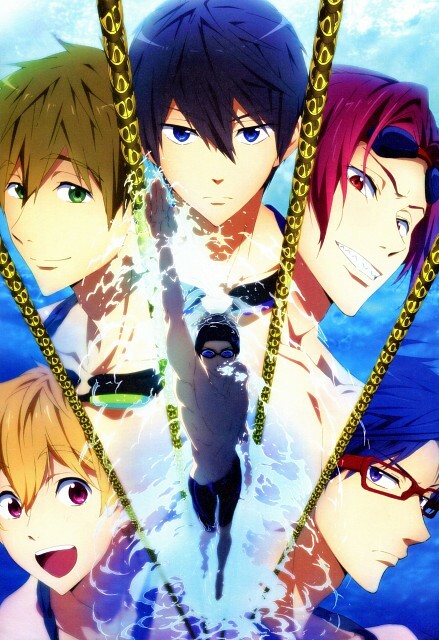 Actually, this is the first sport anime i watched and it's really gives a great impression, although the anime is just a normal life of students who love to swim it's still amazing, the graphics of the water are gorgeous, all the characters are awesome, especially Rin, poor boy, all he had to do is just told Haru that he want to swim with the team again, however, what i really liked about this anime is the friendship that connect the team together, it's just wonderful to choose their friendship over winning the contest, the final episode was amazing, i like the ending song very much (Splash Free) and i really hope that the next season will be great too. 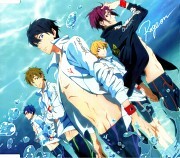 Awesome summer anime i like it very much of course because of the characters and the graphics, is so amazing, i like the water effect it's so beautiful, i like anime like this because of the friendship of the characters, Haru, Rin, Nageisa, Makoto and Rei, especially in the final episode the events turns to be so beautiful, my favorite character is Rin, i enjoyed watching the anime so much, though i expect more action and challenge among the whole anime but i like it somehow, i am looking forward for season 2 next year. It's a fun watching though I expected to drop it after one or two episodes. But since it's funny, pretty (lovely water and the boys are quite cute... Gou was cute too) and light-hearted, and the few anime I had started at the same time failed to grab my attention, why not ? Not a thrilling anime, but it's still fun to see how KyoAni played with the fujoshi hearts. More in hints, clues than obvious facts, so it's ok with people that aren't interested by this kind of relationships, as long as they find fun the way they tease the other watchers. I think it's a bit like a Friends scene where Joey complained to another male friend about their relationship. It was of course pure straight male friendship but the way he was talking sounded funnily like a female lover complaining to his boyfriend that she wasn't taken care enough. The most awaited anime in summer of 2013. It was totally targeted towards the female audience which is clearly evident in those cliches comedic scenes and those naked muscular bodies of bishounens. The plot was overly shallow and easy to follow with shounen-ai flavor that was not so great for you to savor. The artwork was an eye-candy for some but completely proportionately disgusting for others. Despite of those thing being mentioned above still it's worth to pass your time.